70 percent of eligible iPhone, iPad, and iPod touch devices are running iOS 12, as measured by the App Store on December 3, 2018, according to the latest adoption figures shared by Apple on its App Store support page today. iOS 12 was installed on 60 percent of all eligible devices as of October 29, 2018, so adoption is up 10 percentage points in five weeks. Apple also says 72 percent of devices sold in the last four years are running iOS 12. 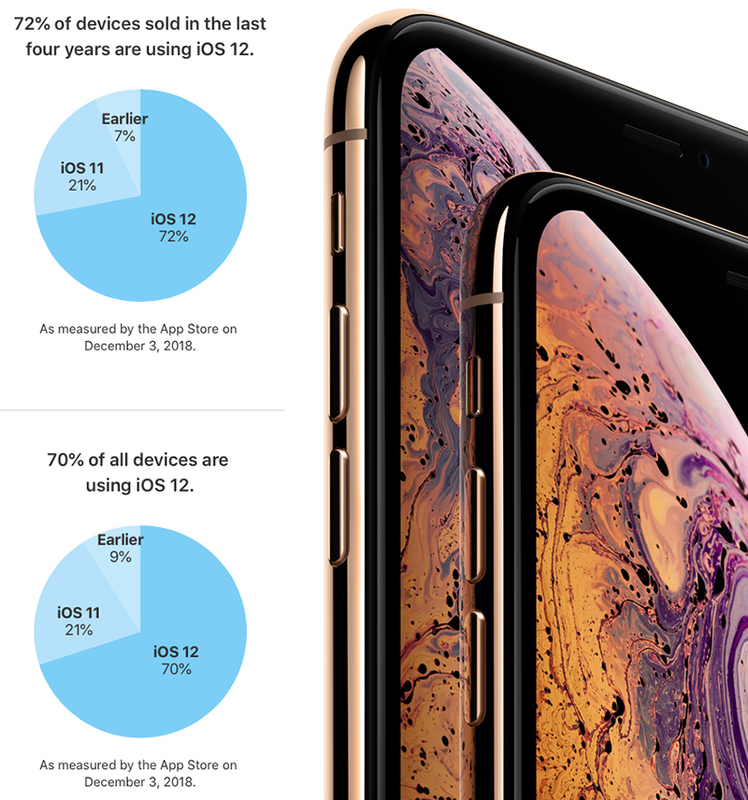 By comparison, 63 percent of devices introduced since September 2014 were running iOS 12 as of October 29, 2018, but those figures cannot be directly compared due to Apple's tweaked wording for this particular chart. iOS 12 adoption is outpacing iOS 11, which was installed on 59 percent of eligible devices as of December 4, 2017, according to Apple. This shouldn't come as much of a surprise, as iOS 11 suffered from quite a few bugs over its lifespan, while Apple has focused on performance and stability in iOS 12. Meanwhile, Apple says 21 percent of all devices remain on iOS 11 and nine percent are running an older iOS version. Doesn't surprise me at all, iOS 11's earlier versions had their issues with lags, stutters and a few glitches. iOS 12 was a pleasant step back to optimization instead of new features and it showed. Way better performance than any version since at least iOS 9.
maybe thats because iOS11 SUCKED! There, i said it. Hmm, if we extrapolate based on this rate, then by mid 2019, Apple will need to start gearing up iPhone production just to have devices to install it on. In late 2019, people will start downloading iOS 12 onto their Android phones even though it'd be useless, and in 2021, iOS 12 will outnumber humans. Eons from now, the big crunch will see every atom in the universe—all comprising various installations of iOS 12—regress to a single point. This probably shows more the frustration at iOS 11 than the satisfaction at iOS 12. I've always bounced between iPhone and Android. After mu most recent change, I'm determined iOS is the best there is even though it's locked down. I’m sure the incessant reminders to update have nothing to do with it. Sarcasm aside, it works much better than iOS 11 on iPhones, but I personally chose to keep 11 on my iPad 10.5” because I find the new interaction/multitasking/control centre changes to be a crime against UX. 11 was a mess. 6 and 10 were the high points for iOS so far. 12 would actually be great, if not for Multitasking, control center, taskbar, gestures all going to hell. The auto update feature was around back with iOS8. I remember my kids accidentally updating to iOS9 on their iPods and crying about all of the changes. I suspect that the increased adoption rate between iOS11 and iOS12 is mainly due to how bad the word of mouth reviews were with iOS11. Lots of people on older iPhones didn't update to iOS11 until the battery and speed issues were addressed. With iOS12, there were none of those reports. Plus all of the iOS11 users on older phones probably updated to iOS12 immediately after the reports were that speeds got better. With those two factors, I'm not surprised that iOS 12 had better adoption rates than 11. Not to mention that the update screens are deceptively designed to fool the user into updating, with the "Later" modal dialog responding with a default positive response to a negative user choice. Woe to those who reflexively enter their passcode and don't spot the true intended "Remind Me Later" option placed at the bottom of the screen like some sneaky fine print. Rather shady from a company that made its reputation on good UX.